Charlie Chan Annex: Button, Button, Who's Got the Button? 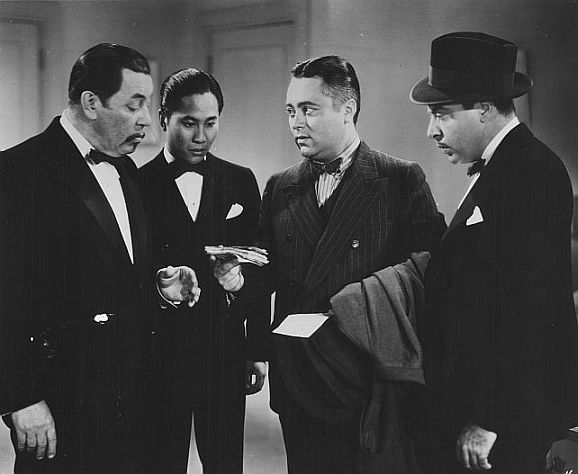 The Charlie Chan Annex is pleased to add another link to our blog. The man who runs it is Doug Palmer, with the incomparable Tory, a stately grey schnauzer like the ones that Warner Oland kept! Doug has sent us a "new" old movie called The Missing Corpse. Is it a Chan movie? J. Edward Bromberg, the editor Murdock in Charlie Chan on Broadway, is Henry Kruger (complete with mustache!). Archie Twitchell, Carter Lane in Charlie Chan at the Wax Museum, plays Officer Jimmy Trigg under the name of Michael Brandon. You'll recognize other members of the cast like Frank Jenks, Paul Guilfoyle, Ben Weldon and Charles Coleman as "Eggbert," the butler! The title of this post, "Button, Button, Who's Got the Button!" is an old saying that fits the plot of this movie. J. Edward Bromberg threatens Paul Guilfoyle for his coverage of Bromberg's daughter (Lorell Sheldon in her only movie as Phyllis Kruger) in the paper. Bromberg doesn't get much more satisfaction from his family so he decides to hightail it out of town without telling anybody. Except for Frank Jenks, his chauffeur, who comes in handy disposing of the dead body of MacDonald in the trunk of Kruger's car. They spend the rest of the movie hiding the body and then hiding it again after person after person after person keeps finding it. The only two people who can't seem to find it are the motorcycle cop after Bromberg and the person who did kill MacDonald! I think we could all use a stiff drink right about now! Now I know where the corpse is! please email Miss Maven for her Maven's Reviews at theoldmoviemaven@yahoo.com for a list of movies from the twenties through the sixties! You might even get freebies!